A former policeman from Sarajevo testifies at the trial of Radovan Karadzic and says that more than 1,000 children were killed in the city during the course of the war. Dragan Miokovic, the former leader of a team of investigators with the Safety Services Center, SSC, in Sarajevo, testified for the Prosecution at today's hearing. Miokovic said he participated in investigations into dozens of shelling and sniping incidents in the city. “According to SSC’s estimates, between 10 and eleven thousand civilians were killed in Sarajevo. So many years have passed and our estimates have proved correct. (...) We estimated that there were between 1,300 and 1,400 children under the age of 15 among the victims. (...) Sarajevo was under siege. "Soldiers, who were under your command, shot at the city,” Miokovic said, answering the indictee’s questions during the course of cross-examination. 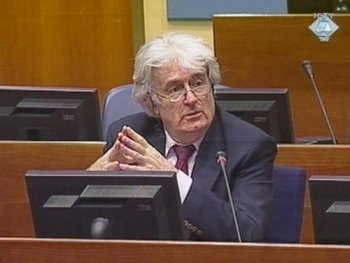 Radovan Karadzic, former President of Republika Srpska, RS, and Supreme Commander of its armed forces, is charged with genocide and other crimes committed in Bosnia and Herzegovina during the course of the 1992-95 war. The indictment alleges that he participated in the design and implementation of a shelling and sniping campaign in Sarajevo. The campaign resulted in the wounding and murder of thousands of civilians. The cross-examination of Dragan Miokovic is due to continue on October 29. The examination of Adrianus Van Baal, former Chief of Headquarters of the UN's UNPROFOR Command, was completed at this hearing. Van Baal began with his testimony yesterday. The indictee questioned the witness about incidents which led to NATO airstrikes against Republika Srpska Army, VRS, positions in August 1994. Van Baal said the NATO air strikes were prompted by the fact that Serbs had violated the heavy weapons exclusion agreement in Sarajevo, while Karadzic tried to determine whether the VRS had legitimate reasons for using the weapons. The indictee presented a series of reports made by the VRS Sarajevo-Romanija Corps, SRC, pertaining to the constant violation of cease fire agreements in the Sarajevo region by “Muslim extremists”, who “continuously provoke us”. “We would lose six soldiers in one day. This means we lost more people when cease fire agreements were in force. (...) Do you agree that we had a legitimate right to self-defence?” Karadzic asked the witness, adding that “Muslim forces” painted their helicopters in white in order to “confuse” them. Van Baal said that often one party would file reports saying the other party had violated cease fire agreements. He said he heard about most of the incidents, but he was never able to get an official confirmation about them. “The fact that we had freedom of movement was of great help as it enabled us to verify those incidents. However, the main question remains whether many of these reports were true,” the witness said, adding the VRS took its weapons back, but “UNPROFOR was not able to determine whether the Muslim forces did the same”. At this hearing the Defence informed the Trial Chamber it had filed a motion for the “immediate cessation of work and suspension of the trial”. The Prosecution will express its opinion about the proposal at a later stage.